" ...the darkness is past, and the true light now shineth." This means that today is the shortest and darkest day of the whole year. It is beautiful to me that the time when the world is as dark, cold and barren as it will be for the rest of the year we are preparing to celebrate the birth of the child who is the "light and life of the world." and decreasing nights of darkness. and new life for every creature on the earth. I hope that as you turn on the Christmas lights on your house, light your Christmas tree, or read in front of a fire that you will remember that even though today life may seem dark, barren and cold that the birth of Christ and His glorious promise of light and life lay just around the corner. For The Light has conquered the darkness. Wishing you a happy Winter Solstice, a Merry Christmas, a Happy Hanukkah, and every other celebration of light held this time of year! Since you brought it up, I've heard before that it's symbolic that Joseph Smith was born tomorrow, on the 23rd. 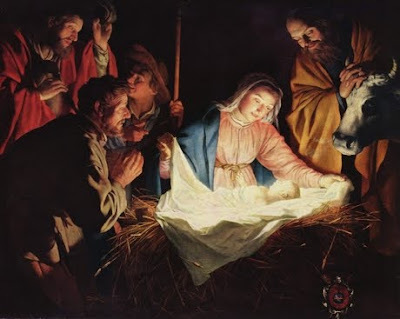 The one who would bring the light of the gospel back to the earth was born on the day that light starts coming back to the earth. I like the photo you chose here. Nice. I wrote about the solstice as well. needed to hear this! Thanks!